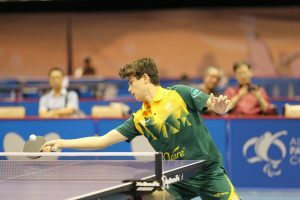 Australia’s Mateo Dvorani has pulled off a massive upset win, defeating Belgium’s Laurens Devos 3-0 at during the Under 18 Team Event at the 2018 ITTF Junior Circuit Cook Islands Junior & Cadet Open. Devos is no.50 in the Under 18 World Rankings, while Dvorani is currently unranked. The Aussie is fresh back from a three month training stint in Germany, and today Dvorani cashed in the hard work behind him. Despite the effort, Australia had to make do with 1-3 defeat at the hands of the Ireland/Belgium team. It is all positive signs for Dvorani, who will be focusing on the YOG qualification event that is just around the corner. It will be his last shot at taking a ticket to Buenos Aires.